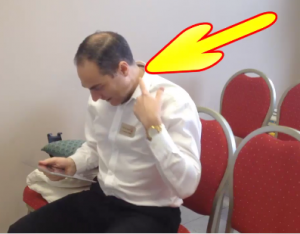 Vaughan, ON – In this video, I’m going to show you my six step protocol that I have used to help many people in my office that had been diagnosed with L4 L5 disc bulge and L5 S1 disc bulge. Stay tuned to the end to get through all these six steps. Helping you relieve pain, conquer stress, and supercharge your health the chiropractic way. Hi, my name is Dr Walter Salubro. I’m a chiropractor and Vaughan, Ontario, Canada, and welcome to this video. And in this video I’m going to walk you through my six step protocol that I’ve been able to use to help many people get through their discomfort and relieve their chronic pain and get their life back, essentially, that have suffered with disc bulges in their low back. Now, the first thing I want you to really get is not to give up. I’ve received the many, like hundreds of comments and questions in my videos below, in my other disc bulge videos, which you can check up here and people are looking for solutions and they’re looking for hope. And my whole objective with this video is to lead you in the right direction, to be able to ask the right questions with your therapist or doctor, to make sure that you’re getting the right protocol in place for, not only just the diagnosis of the disc bulge, which most people get, but also some protocols to help you begin the corrective process and the healing process to get the chronic pain subsided, and get your life back to full function. Hey, Dr. Walter here. I am going to show you WHAT A SPINE looks like normal alignment, normal spinal model and why it’s important to check it. Why I as a chiropractor, why chiropractors in general, check the spine. So let me show you this spinal model here. This is a plastic model. So the spine has a normal alignment and this alignment is straight from front to back. So normal alignment is straight from front to back and from the side it has these three curves. So, the spine should look straight from front to back and curved when looking through the side. The white blocks over here, these are the bones. There’s 24 movable bones in the spine. They’re called vertebra. In-between these bones these are the discs. You may have heard of bulging discs, herniated discs, disc degeneration, this is the degeneration that can be anywhere along any one of these bones. This more commonly happens in the lower area of the spine, the lower back and the neck area. But of course, it can occur in the middle back. The different regions of the spine they’re called; upper part, this is the neck region that’s called the cervical part of the spinal so cervical spine, the middle area where the ribs attach that’s called the thoracic spine, and the lower back is called the lumbar spine. The lower back has five vertebra, five lumber vertebra. The middle area has 12 vertebra. The cervical area has seven vertebra. At the bottom, the base of the spine, the backside here, that’s the sacrum. On the side over here is the pelvis and the pelvis. So, the spine sits on the actual sacrum. The sacrum is like a foundation to the rest of the spine. On the inside, this is the whole purpose why chiropractors check it, it will be hard for you to see it, but on the inside is where the spinal cord is. So the spinal cord runs from the brain, in through the spinal canal, behind all of the spinal bones and then ends about L1 L2. It then branches off as the nerves that reach into the lower lumbar and (something) region, and they go into the legs. So, every single organ system in your body, every single body part, every single gland, every single cell every, single tissue, in fact everything in your body, connects to your brain through the spinal cord which is inside the spinal column. Through all of these nerves called spinal nerves. There’re 31 pairs of nerves, 31 on each side. So, if you look at this poster down here, this is the brain, spinal column, inside the spinal column is the spinal cord. Spinal cord branches out to 31 nerves and goes to all your organ systems. So, there is nothing in your systems, in your body, that does not connect to the brain through your spine. And that is why, as chiropractors, we check the spine. It is impossible to have optimal health, or express full health, and be well without the brain connecting properly with your body. You don’t have to take my word for that, I mean look at some of these extreme case examples. Someone like Christopher Reeve’s, if you remember him, he played Superman in the 70s and 80s great movies and great actor. He had an injury. He fell off the horse while horseback riding and he fractured a part of his neck at the very top, that bony fracture that bony fragment injured his spinal cord. What happened? He was paralyzed from the neck down, couldn’t move his arms, couldn’t move his legs, couldn’t function and needed all kinds of support. He was in a wheelchair. So, he had no connection from his brain to the rest of his body, into parts of his body that controlled his major organs systems and also his arms and legs, especially his arms and legs so he couldn’t walk, couldn’t move. So, he had no connection from brain to body from the neck down, so he couldn’t function very well. So that’s how important that is for that. If you’ve heard of other spinal cord injury cases, you’ll see people do not function to the full capacity. They’re very very limited and very disabled. So the same thing happens without extreme cases in the same idea. So the spine should have a normal curve. Right. And if someone begins to bend forward like that with their spine and their posture, now what they’re doing is they’re stressing the bones over here where the bend is occurring causing advanced degeneration to occur. But more importantly is actually stretching the spinal cord on the inside, irritating that nervous system and it can cause a whole bunch of local inflammation which leads to pain response, muscle tightness, immobility, increases the stress response in the body, alters posture which is not good, and overtime can actually degenerate. But more importantly, it’s actually irritating the nervous system and basically interfering with that connection from brain to body, so that cannot lead to good things. So as a chiropractor we check for these misalignments, if they’re twisted or turn. We checked for these abnormal positions of the spine and then we apply corrective techniques to actually correct it. So put them into proposition and restore that normal alignment. And the amazing part is that people get well when we do that, it’s phenomenal. So, when there is that interference from connection of brain the body, people are sick. When there is a better connection from brain the body, people are well. And as chiropractors, we help facilitate that correction. But the healing happens within you naturally because those healing abilities are already inherent than innate in you and it travels through the connections of the nervous system. But when it’s interfered with that, that connection interferes with the healing ability. When we restore alignment, that connection is restored. And now people function, heal and their body is repairing better. They’re having less stress, less inflammation, improved posture, and they’re living their life really really well. So it’s kind of a crash course on spinal anatomy, why we check it as a chiropractor, the relevance to the nervous system and overall people’s health. If you have any questions while you’re watching, just pop them in the comments below. I’ll stay on for another few seconds to see if there’s any questions, if you like this tutorial Be sure to give me some thumbs up. Hit the Like button. Share it with your family and friends. You know I find that spinal health seems to be the big missing link to people’s health improvement these days. Many people have been taught that you need to eat while which is true. You need to eat well, have good foods put good food into your body. You need to drink good fluids. Water really good water. You need to exercise, keep your body moving. All of these are important. Stress is a big factor these days. You need to watch your stress levels and manage and have strategies for stress. You need to have good sleep, rest and recovery. But I want to ask you, have you ever been told that you need to keep your spine aligned properly and taken care of? Because you know what, it protects the nervous system and that controls everything else. You can do all the other things really well and habitually which is great, but if this is like that, then now you’re going to be limited big time with your health. And that’s where chiropractic comes in. 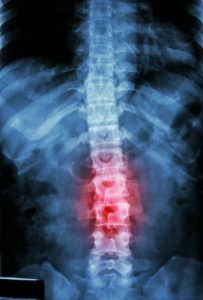 Chiropractic is the missing key to people’s health care in most cases, but more and more people are realizing that these days and when they’re not finding the solution elsewhere with other things that are doing, they come to the chiropractic office and it tends to be that last resort that really really helped them. So that’s my tutorial video for today. Hope you enjoyed it. Thanks for watching and I’ll catch on the next video. When a n ew patient first comes into my office for a check up, I assessed them for structure and function. Posture: Normal posture from the front is when the mid forehead, nose, chest bone (sternum), and pubic bone is all centered. From the side, the ear, shoulders, hips, knees, and ankles all line up. The function of the spine is to protect the nervous system (spinal cord). The spinal cord connects the brain to the rest of your body via spinal nerves. So the function of spine to protect the spinal cord is super important. Why? Because your nervous system controls all body functions, all healing, and recreation and repair of all cells. So our aim with chiropractic is to discover the structural problems in your spine, called Vertebral Subluxations, which interferes with the function of your body and the expression of optimal health. When we correct the subluxations, which specific scientific chiropractic adjustments, we are removing the nerve interference causes by subluxations. This allows your body to health and function again normally, the way it is innately designed to. And this leads to better health expression. Our goal at BTHCC is to lead you to better health the chiropractic way. Vaughan, ON—Here’s a quick tip that will save you from neck strain, next pain, and future health problems while using an iPad, smart phone or any other handheld device. It’s not just important for you, but also for your children and teenagers. Often times I’ll see the kids come into our office and they’ll be holding an iPad or smart phone, or some other handheld device. And they’re sitting staring at their handheld device with their neck completely bent down into their device. The problem is that there’s too much bending that can cause major strain and stress on muscles, spinal tissues, bones, discs, and nerves. The strain and stress will pose a problem, not just now, but also in the future. This can cause a lot of tension on the nervous system and lead other health problems. device, grab a couple of sofa pillows, have them stack the pillows on their lap. Then have them place their elbows on the pillows while holding the iPad or handheld device. It will now be closer to eye level. Now they can use your iPad, smart phone, or handheld device with their elbows propped up holding the device at eye level instead of having their neck being completely bent forward or flexed down, which is not good. This will prevent this constant bending of the neck. Because it brings the iPad device or handheld device up higher closer to their eye level. It’s a very quick and easy hack that you can do at home. It’s not expensive. And very easy to do. Another thing you can do is grab an iPad holder or an iPad stand if you’re using an iPad and place it on the stacked the pillows on the thighs. This will keep hands and elbows free if they get tired holding the iPad. If more height is needed for the iPad stand then stack one or two more pillows on the laps so you can hold the iPad stand higher close to eye level. Be sure to try it. Teach your children and teenagers. If you found this tip useful share it with a friend or family member, someone that you know could use this and find value in it. And also enjoyed this video, like the video, share it, and leave a comment if you have any questions. 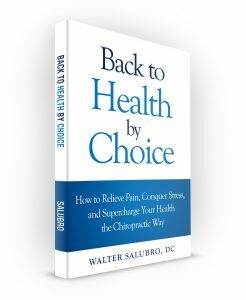 Dr. Walter Salubro is a family wellness chiropractor, the owner of Back To Health Chiropractic Centre in Maple, Ontario, and the author of Back to Health by Choice. He grew up in Toronto, Ontario, and moved to Vaughan, Ontario, with his family at the age of fifteen. Dr. Salubro graduated from York University in 1996 and from the National College of Chiropractic in 1999. He has been practicing chiropractic and serving his community of Maple and Vaughan for over fifteen years. Dr. Salubro provides chiropractic care to people of all age groups. He is trained in applying specific chiropractic techniques that are just as suitable for children as they are for adults. In addition to offering specific spinal adjustments and posture corrective techniques, Dr. Salubro offers an extensive lineup of health seminars, exercise classes, and a run/walk club to his patients. Dr. Salubro is an avid runner, having completed multiple marathons and half marathons. 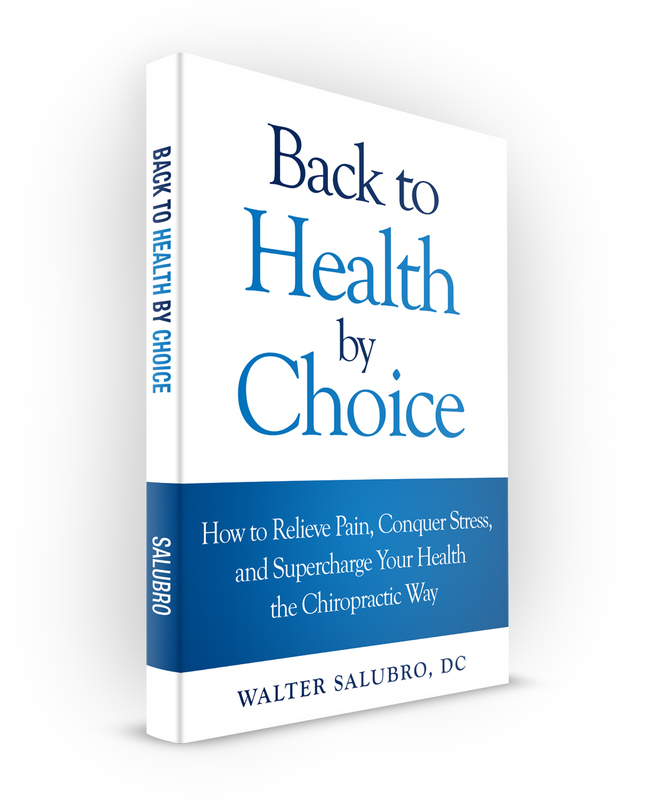 Dr. Walter Salubro is dedicated to providing exceptional chiropractic care for all his patients. He caters to the care of infants and pregnant mothers. Dr. Salubro is certified from the Academy of Chiropractic Family Practice and the Council on Chiropractic Pediatrics (CACCP). Dr. Walter Salubro is Webster Technique Certified, which is certified and recognized by the International Chiropractic Pediatric Association (ICPA). Headaches affect 59% of Canadians. That 20.74 million people in Canada that either suffer of headaches or have suffered of headaches. I don’t get angry, usually. There are two things that I hear that just infuriate me. First, let me tell you about Jane. I met Jane at one of our community outreach events and she tells me she has had headaches since she was 13 years old. Her age today is 43. That’s 30 years of suffering with headaches. THIRTY YEARS! Maple, ON—In conclusion of Restricted Mobility Awareness Month, I want to share with you an integral research study about arthritis. That’s right! Two (2) weeks. How does this related to chiropractic? A misalignment of the spine (vertebral subluxation) is a spinal joint that has restriction mobility. Which means that when spinal misalignments (subluxations) are not corrected immediately, that spinal joint will begin to have irreversible joint damage (degenerative joint disease). Arthritis is NOT the problem? Let me tell you about Mr. Mike, who is 68 years old and has trouble walking. Mr. Mike comes into our office and tells me he has back pain, tingling in his right leg, and has trouble walking. What Mr. Mike has is osteoarthritis, also called degenerative arthritis or degenerative joint disease. Osteoarthritis is the most common form of arthritis, which is a wear-and-tear type of arthritis. Here’s my issue when people tell me they already know they have arthritis. Arthritis is Not the Problem! I’m not saying that arthritis does not cause pain, discomfort, lack of mobility, and suffering, because it does. What I’m saying is this…Arthritis is an indication of an underlying problem that has already existed for at for at least the past 20 years. 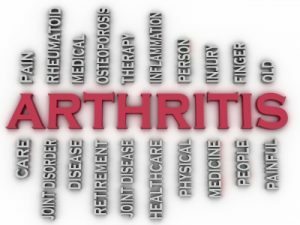 Posted in Chiropractic, City Vaughan chiropractic clinic, Dr. Walter Salubro, How Chiropractic Helps People with Arthritis, How Chiropractic Helps with Restricted Mobility, Town of Maple chiropractic clinic | Comments Off on Arthritis is NOT the problem? A recent visit to a local nursing home humbled me. I will tell you about it but first I want to remind you how grateful I am. I recall about nine years ago when I ran my first 10k race. I hardly trained for it and it was going to run a 10km distance for the first time. By the time I was half way through, my legs felt so heavy and my muscles were in excruciating pain. Only one thing got me through the finish line. That’s right. I had a overwhelming sense of gratitude. Through all the pain, the sweat, and the fatigue, I kept on saying to myself, “I’m so grateful for my legs. I’m am so grateful for my muscles. I’m so grateful for my strength”. That’s the only way I pulled through. I crossed the finish line. Why do I tell you this story? Well, I tell you because if you are able to walk and get around on your own two feet and legs, then you should be grateful too. You see, there are many people in our society, maybe even people you know personally, that have a restriction with their mobility and require the use of a cane, a walker, or a wheel chair. If you don’t know of any personally, then visit a local nursing home and you will see how common this is. Recently, I went to visit a family friend in a nursing home with my wife. After we were done with our visit, we were waiting for the elevator. About 50 feet away from us was a sweet elderly woman in a wheel chair. She then starting yelling but because she spoke a language that was foreign to me, I didn’t understand what she was saying. She kept on yelling. I realized it was more of a distress call and that she was trying to get my attention. I walked over to her. Her frailty and weakness was really noticeable. I then saw that she was slowly slipping off her wheel chair. So I immediately helped her up into a seated position. What she did next melted my heart. She tilted her head down, put her face in one hand, and started to cry. Tears were pouring down her cheeks. I looked at her, held her hand and told her, “It’s okay”. It suddenly occurred to me how helpless she must have felt and how she probably wished she had the strength to help and support herself. What would she give to be able to walk again? What would that be worth to her? There’s no amount of money that can equate to this basic need and value as a human being. This is why we should all be grateful for our ability to walk and get around with our own legs and our strength. 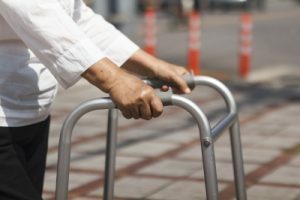 But there are far to many people who have restriction with their mobility and depend on external devices likes a cane, a walker, or a wheel chair. And this is why at Back To Health Chiropractic Centre, we are honouring Restricted Mobility Awareness. That’s right, May is Restricted Mobility Awareness Month. Our aim this month is to focus on reaching out and helping people with restricted mobility; anybody with a cane, walker, or wheel chair. How can we help? With chiropractic care. Chiropractic can help improve power to muscles, increase mobility of restricted joints in the spine, hip, and knees, and it can help increase strength. If you know of anyone in your circle of family and friends who is currently using a cane, a walker, or a wheel chair, then refer them for a chiropractic check up today. They certainly can use it. If they need encouragement or reasurrance, then bring them to our office yourself. And, if they want the check up but can’t get to our office, then I will do my best to get to them with a home visit. Remember the story of the elderly lady above. Let’s start seeing more smiles on people’s faces and not tears. Together, we can make this happen through chiropractic. Call our office today at (905) 303-1009 to discover how chiropractic can help with restricted mobility. ** Copyright NOTICE **: This article was written by Dr. Walter Salubro and is copyright by Dr. Walter Salubro. Attribution is required for re-posting of this article. Re-posting this article on your website or blog is permitted only if you credit the author, Dr. Walter Salubro and post a backlink to www.BackToHealthChiropracticCentre.com. Suggested attribution: Article courtesy of Dr. Walter Salubro at www.BackToHealthChiropracticCentre.com. Dr. Walter Salubro is dedicated to providing exceptional chiropractic care for all his patients. He caters to the care of infants and pregnantmothers. Dr. Salubro is certified from the Academy of Chiropractic Family Practice and the Council on Chiropractic Pediatrics (CACCP). 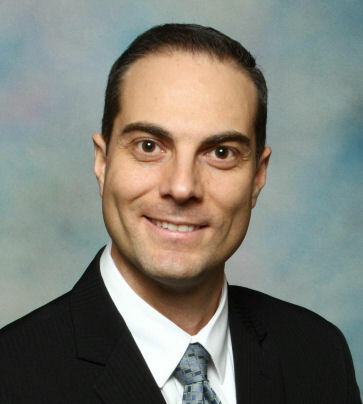 Dr. Walter Salubro is Webster Technique Certified, which is certified and recognized by the International Chiropractic Pediatric Association (ICPA). Maple, ON—Stress affects so many people. Stress has been associated as a contributing factor to many diseases and illness, such as heart disease, high cholesterol, digestive problems, immune system problems, cancer, diabetes, and more. It is therefore crucial to have an understanding of stress so you can start to realize how it affects your life and your health. With this knowledge, you will be better motivated to look for ways to bust the stress patterns in your life. The benefit to this is a healthier, happier, and more peaceful life. And who wouldn’t want that? Here is a short video tutorial that shows you how and why stress “get’s on your nerves” and affects your life and your health. 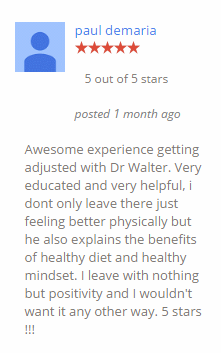 "Leading you to better health the chiropractic way." By: Dr. Walter Salubro, your Maple family chiropractor & Back To Health Chiropractic Centre, your Maple family chiropractic clinic. Also serving the City of Vaughan, your City of Vaughan family chiropractor & your City of Vaughan family chiropractic clinic. Disclaimer: All information on this website is provided for educational purposes only. Consult with your health care provider regarding the advisability of any opinions.